It’s February, and the house is still not organized and the only bill currently on file is the previously mentioned SB 22- Shellfish Enhancement. A hearing for SB 22 was held on Wednesday in Senate Resources where Julie Decker of AFDF and Sam Rabung of ADF&G gave an overview of the Alaska Mariculture Development Plan and answered questions of committee members. Testimony was taken, and all the testimonies except one showed support for the bill. However, a second hearing that was set for next week was postponed. Applications/Nominations are now being accepted for Federal Subsistence Regional Advisory Councils. The deadline to apply is February 8. Link to RAC Nomination Packet. Want to know who currently serves on the RAC in your region? Link for RAC Regions. ADF&G Commissioner consideration Doug Vincent-Lang will have a confirmation hearing on February 4 in Senate Resources. Details in schedule below. Notice of Availability of Federal Assistance 2020. 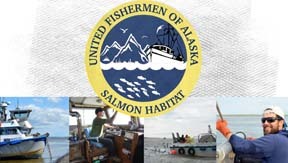 The Fisheries Resource Monitoring Program is seeking technically sound projects that gather information to assist in the management and conservation of subsistence fishery resources on Federal public lands in Alaska. For more information, please read the Announcement. Update on International Pacific Halibut Commission (IPHC): (As reported by UFA President, Matt Alward) The 95th annual meeting of the IPHC happened over this week and the commissioners came to a catch limit agreement, setting the opening date of March 15th and a closing date of November 14th. In the big picture, halibut stock assessment from 2018 raised the overall spawning biomass due to data from expanded survey stations (and what they think is a big 2011/2012 year class) therefore the overall catch limits went up this year.On the other side there are some week year classes that are moving into the fishery and they expect the biomass to decline over the next years with any removals over 20 million pounds a year. This was the first time in a long time that all of the U.S. members of the Conference Board voted for the same catch levels for all U.S. areas, but we did not agree with the Canadian catch limit that they proposed. The commissioners agreed to give area 2A a fixed floor of a Total Constant Exploitable Yield (TCEY) of 1.65 million pounds due to tribal treaty rights with the USA for the next four years. They also negotiated a deal with the stock allocation between Canada and the USA to give them 17.7% of the coast wide TCEY for this year and a formula that will be close to that for the next three years. The report from the meeting may be found here: Report of the 95th Session of the IPHC Annual Meeting (AM095). 1. Legislation – happenings from this week on fishery related bills we are tracking. 2. Legislative meetings of interest for this weekend and the week of February 4-8, 2019. To watch hearings online go to legislative home page at http://w3.akleg.gov/ at the time of the hearing, and click on the “Live Now” tab, and then select the meeting. To watch floor sessions and other hearings see Gavel to Gavel archives. To find your legislators and contact info see http://w3.legis.state.ak.us/ – see “WHO REPRESENTS ME?” in the lower right corner of the page. 4. Bills related to fisheries, and others that may be of interest to fishermen. This update is made possible by the support of our Group, Business, Individual and Crew members.